Just being Devil's Advocate, but say Mike Ashley decides Cav House is one House of Fraser store too many and closes it down. Is that Newcastle United's fault? Should we pour scorn and ridicule on the Toon then buying Eisa from City for £24m? Does he run the football club through SD though? That’s what Egotricity do. It’s an interesting alternative view for comparison purposes, but as RCS has already correctly concluded, the situation is most definitely not analogous. And OTC lost for words? Can hardly wait to hear his lickspittle defence. Maybe we could run a bucket collection when we play at TNL: “Robins Trust Ecotricity redundancy hardship fund” with an information poster about the job losses to raise awareness amongst their fan base, and show that CTFC care about the Gloucestershire community. Oooh, a big banner held aloft by the fans would be nice, pointing out how Mr Winchester's salary and signing on fee came at the expense of X amount of jobs. That would send a pretty powerful message if we could establish a few facts and figures. As a complete guesstimate but not beyond the realms of possibility, one could envisage a signing on fee of some £60k+, plus a salary of around £40k+ per annum, so in the first year alone that would account for the loss of 6 junior EcoTricity jobs. I suppose he will set a target for the season of at least one goal for each poor soul that lost their job for him. Now, wouldn’t that be a touching gesture? Obviously, it would depend on the size of signing on fee but I'd be amazed if he's on anything less than £60k per annum. Chelt's top earners were on around £75k in 2012. The old adage “polishing a turd” seems entirely appropriate here, and should guarantee him a very warm welcome when he comes to Johnny Rocks. Personally, I can’t wait. A slim and fit Carl Winchester had the honour, as FGR Captain, in leading his team out to centre circle for the CT Trophy tie v Cheltenham Town FC. I’ll wager the result left you “chuffed to bits that FGR were able to run rings round them”? I hope you are not gleefully goading the CTFC fans OldCheshireCat? The Mods will close the thread or even ban you. Lord ‘E, You have expressed a very strong opinion on Carl Winchester which is proving to be false. It is only right that our difference of opinion on said player is backed up with hard facts. Carl has been an ever present member of the unbeaten FGR team and is current joint top goal scorer. He scored his third league goal for FGR on Saturday against Port Vale. In the name of God OTC, can you ever just stop. Find your mates, round them up then fvck off. I can`t understand why he is obsessed with our club,i suspect he is a lonely old sod who is dismissed by fgr.followers as the " village idiot ",how sad would that be ? What else are we going to talk about? There's been literally nothing going on this season. I`m sure they don`t post on fgr.site very often ? Aaron Downs was at the FGR v Colchester match to say hi to Winchester & Pell. Surprised to see AD leaning on crutches and asked him what he had done especially as he was no longer a player. He said he still gets hurt as a trainer. I told him that Winchester was a good acquisition for FGR and he readily agreed and loved the goal Carl scored against Carlisle on Saturday. AD said he was surprised that Carl was subbed tonight which I agreed with. Nice talking to Aaron. I wish him well in his future career. He's not that good. He's ended up at full back for you as he did for us, and is pretty much a liability there. He has an aura with fans who think he's gods gift (he did here and the way you speak it seems he has with your lot) but if you look at his actual performance he is a lower league two/top of Conference player. If he is that good why has he ended up being moved from midfield to playing full back (badly), two years in a row, for two separate struggling league two sides? I'd respectfully suggest if he plays in midfield for you all year you will end below us in the league. Ben3, this is the player many called 'Winniesta' while he was at CTFC and many considered him one of our best players. Because it turned out that this employee of the club wasn't actually a life-long fan, willing to dedicate his entire life to us and saw the opportunity to earn more money and hopefully advance his career, he took it - and now he's apparently rubbish, a cheat, overweight, etc, etc. Agreed - Winchester was one of our best players without a doubt. I can't comment on whether he still has retained that ability at FGR as I don't follow them, however it is extremely probable he is still as good there. What’s not to get? An overrated sprout who almost got relegated last season. Of course whilst a player is at CTFC they get supported and positive nicknames. I called him Winiesta - not because I thought he was a quality player but because he was a CTFC player. We used to sing that Parslow was better Varane even though he was one of the worst Football League defenders we have had. Nothing wrong with supporting your own players with hyperbole and being more honest about them when they have moved on. In God’s name. Whaaaaat ???? I wrote that “turd” piece in July and it’s now almost December, but as per usual it has eaten away at you, so you have quite obviously stored it away in your little black book and waited for that opportune moment when you can try and debunk someone’s opinion with your make-believe “facts”, which you then blurt out on our Forum, in the mistaken belief that you are able to “run rings” around Robins Nest Forum members with your self-assessed ‘superior intellect’, and then you gloat about it on the FGR Forum. So mind-numbingly predictable. On your original response you were gloating at FGRs unbeaten run and that Winchester was scoring the goals to maintain that run. Can you tell us how many times this season FGR have now been beaten with your hero-worshipped Winchester in the team? 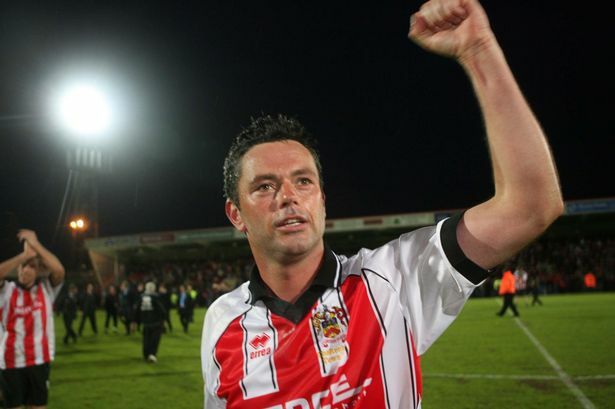 Are you aware that Winchester struggled to hold a position in the Oldham team and that’s why he came to Cheltenham to try and re-energise his career? But you are aware that Cheltenham almost got relegated with Winchester in our team. Winchester, as others have stated above, has now reverted to FGRs defence. Be afraid. FGR are slipping down the League. I don’t get why you have to keep coming on our Forum after you are well beaten in a debate, only to retry your luck further down the line in the vain hope that something may have changed, in order to try and strengthen your chronically arthritic hand? You really need to get back in your box, I will even offer to nail down the lid for you, and for good measure we can ask the Vegan Green Goblin himself to put a big juicy ‘steak’ through your heart. You do only come out at night, after all, don’t you? ps: How’s your USwitch request to change your power supplier to EcoTricity progressing? Enjoying this thread, but to point out one thing. Winchester was switched to full back at FGR due to inadequate cover in that position. He'll be back in midfield once Sheppard returns. CW is a decent League Two player but no higher. As for OTC, are there issues of lucidity? Serious point. Yeah, that's why he was moved to right back for us too...and he ended up staying there.